Can't blame someone for accidentally dropping the bass. Skrillex. That's a pretty big name is music right now. In fact, amongst the electronic music circuit, he's pretty much THE big thing. Though he acted as the lead singer of the band From First To Last and had put out music prior to this, it was 2010's "Scary Monsters and Nice Sprites," released on Deadmau5's own label, mau5trap, that caught the public eye; ever since then, he has been considered a god of dubstep. Whether this moniker is well-deserved is debatable, but what's undeniable is the influence of this record. But is it really as good as it's been made out to be? First up is Rock n' Roll (Will Take You to the Mountain), and that song alone will tell you entirely what Skrillex is about. All the wacky trademarks of Skrillex are here: pitched and bent vocals (this time saying that "together we can play some rock'n'roll," even though this song has no rock'n'roll in it), some serious bass grinding, and enough crazy mixing of various sounds to create a composite of party proportions. This is the first of two songs in which a clip of YouTube cup-stacking sensation "speedstackinggirl" is featured where she shouts, "Yes! Oh my God!" Skrillex must have a real interest in that sound byte; surprisingly, it fits the song, though. In a nutshell, all of his talents are at play here, ultimately resulting in a rather varied and upbeat track. For this reviewer, however, it's all about the title track, Scary Monsters and Nice Sprites. It's a hefty mash-up of a shrill synth melody and some chopped-up vocals (although they are far more clear at the end), spread evenly between bouts of some amazingly volcanic bass growls, the likes of which aren't often heard in mainstream music. (And, of course, the voice of "speedstackinggirl" returns for another round.) Is the bass melodic in any way? Not particularly, but it's more about the raw, angry sound in this case, rather than the composition. This one will give your sub-woofer a run for its money. It will also scare any and all family pets... and Grandma. Yet Skrillex is not content with living beings. That's where Kill EVERYBODY comes in. No, not "Kill Everybody." I mean, kill EVERYBODY, with emphasis on EVERYBODY. Let no one survive! This track is a real thumper as well, boasting more of that beloved floor-warping bass that has become a signature of this style of music. Pitched vocals tell us that he/she/it wants to kill everybody in the world... and eat your heart! Then we switch quickly into a frantic succession of choppy edits between bassline and an actual synth melody. Hmmm, now that I see it, music such as this, which deviates substantially from the mainstream norm, is difficult to describe. How about this: it'll chew you up and spit you out. Yeah, sounds appropriate. But not every song is as gritty and in-your-face as the ones already mentioned. The fourth song, All I Ask Of You, featuring the nasal vocals of Penny (Penny who? Your guess is as good as mine.) is much more methodical and laidback, with no scary noises whatsoever. Instead, it's more of a trance tune with a beeping synth that, more often than not, feels ever-so-slightly off-beat. Perhaps that was the point? Any modern house producer could have churned this one up, but that makes it all the more accessible. I actually enjoy this one as well; it shows off Skrillex's calmer side; I wouldn't mind hearing more of it, to be honest. Rest is for the weak, however, as Scatta clearly demonstrates. Upon joining forces with the likes of the MCs from Foreign Beggars and the production team, Bare Noize, a hearty concoction of dubstep and British rap rises from the studio cauldron! There's definitely some raw power here, showing off some naughty bass yet again, but this track doesn't the pull factor that the others possess. I tend to skip it, although there are a few interesting qualities found within, so it's worth at least one listen. The final original track on this EP is With You, Friends (Long Drive). Even slower than "All I Ask Of You", this one's chock full of chopped up vocals and is far more relaxed than anyone would expect from someone who just pumped out tracks like "Scary Monsters and Nice Sprites". Skrillex includes a number of nice elements, including some attractive piano work and organ-style synths amidst other semi-bouncy sounds before building everything up into an electro-house bomb. It's a great way to end the EP: on a happy note! But wait! There's more! As if all that delicious audio goodness wasn't enough, there are remixes as well! 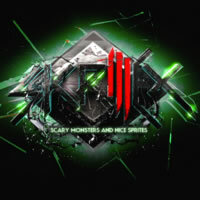 The Noisia remix of "Scary Monsters and Nice Sprites" initially takes the song in a slightly more drum & bass direction. During the strong bass numbers, the remix stays true to the original, more or less, adding some weird filters to the already wild material, alongside some unusual sound effects, one of which I think I heard courtesy of a headcrab in Half-Life for the PC. I could be mistaken, though. The Zedd Remix of the same song is more straightforward in presentation, delivering an unmistakably house take. Original elements are plunked into the mix, but sometimes the song feels as though it's a completely new creation. In the end, however, it's an ample blend of old and new that is far more dancefloor-friendly than anything Skrillex could ever pump out. Lastly, the Bare Noize remix of "Kill EVERYBODY" mixes up things as best they can, and the result is a bit more frenetic in an attempt to make things exciting than the original, though not necessarily always succeeding. This is the release that not only put Skrillex on the musical map, but it also earned him several Grammy awards. That's definitely saying something about its quality. The majority of tracks have pleased me, although not every song is a definite winner in my books. Is it the greatest dubstep (or, as he declares it, "complextro") record out there? That's for purists to decide. All I can say is that, for the electronic music enthusiast, "Scary Monsters and Nice Sprites" is definitely something worth holding in your possession, both as a curiosity and as a solid addition to your music library.